A Flash Flood Watch is in effect Thursday morning through Thursday afternoon for NE counties. Winds may gust overnight 20 mph to 30 mph. Rain is forecast from Wednesday evening through Thursday afternoon. A Flash Flood Watch is in effect Thursday morning through Thursday 6pm for NE counties. A Flood Watch is in effect from Wednesday night through Thursday afternoon for most remaining counties. Winds may gust overnight 20 mph to 30 mph. A Small Craft Advisory is posted until Friday morning for coastal waters. Rainfall of 1” to 2” is forecast for Thursday, with locally-higher amounts possible. There is potential for localized flooding in urban areas, roadways, locations with poor drainage, and waterways. Minor coastal flooding may occur with the Thursday morning high tide in Monmouth and Middlesex Counties. 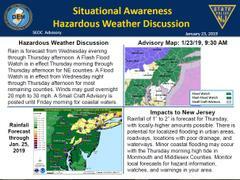 Monitor local forecasts for hazard information, watches, and warnings in your area. Avoid areas where flooding normally occurs. "Turn around... Don't drown..."